Tokyo Mart in Northbridge is a Japan lover's paradise. From shiso to shochu, it's all there. Tokyo Mart in Northbridge is a feast of Japanese goodies. After we came back from our last trip to Japan, our withdrawal from a cold icy chu-hi and all things Nihon-go was extreme. Tokyo Mart helps ease the transition back into non-Japan world. From all the raving we've heard about Tokyo Mart we were expecting a supermarket the size of a large Coles, but it is more the size of a little independent supermarket. A lot of the goodies you can find in regular Asian supermarkets but they do have some lines we haven't seen elsewhere, and it's the biggest range of Japanese stuff we have found under one roof. Plus most items have explanatory shelf stickers written in English with cooking suggestions, it's a real learning experience. The lovely checkout ladies alone make Tokyo Mart worth a visit. Highly recommended. As you enter there is a corner full of sake, beer, plum wine and shochu. While the prices are nowhere near as cheap as Japan, the range is far more extensive than your average bottle shop that would mostly just stock Go-Shu. We find the elusive ch-hai in a can. This one is made by Takara, while most of the ones we had in Tokyo were Kirin brand. At around $5.50 a can its as pricey as a pre-mix here. Yummy plum umeshu with ring pull tops. Tetra packs of sake. Don't get them confused with the orange juice in the morning, or you will be confused. The smaller 900ml cartons are a reasonable price. The range is extensive, prompting us to find out more about the different flavours, brands and regions they come from. An experience at Saki Restaurant with Davatronics and Miss Von Trapp recently showed us the joy of matching the right sake with the right food. We have previously tried this gold flaked number at a dinner at Wagaya. You'll save yourself about $20 on the price if you buy it here, and your poos will always sparkle. We are tempted to buy a bottle of shochu to make our own chu-hai (Alison's favourite is with umeboshi and Shawn's is with a mixer of bitter lemon we still can't find here). With summer coming up this might mean some lost afternoons on our balcony. Some of the bottles we could buy just for how visually beautiful they are. This one has little demons hidden inside the circles of clear glass. This one was (literally) the biggest bargain of all. $17.02 for 1.8litres! There are helpful colour coded stickers on all the shelf labels to help you identify your preferred style. This one has cut pandas - I love the little panda bottoms. Moving on from the spirits, there are many other treasures lurking on the shelves. We will be trying out this cod roe sauce with our sgeddi later in the week. The little signs that explain how to use the ingredients are really helpful. Shawn investigates the origin of this Pocari, only to be disappointed it's not made in Japan. Japanese-made Pocari Sweat is far superior to all others, less sweat, more Pocari. This man is looks to be enticing us into good health in a can. Can we trust a man in a pink tie? There's a wide range of frozen goods here, we regretted not being able to get anything home in time to keep it intact. We think we might have tried this freshly made in Narita. If it's the same, it's like a super sweet eggnog. Mmmmmm chocolates. No green tea kit kats though. This is our favourite white choccy. It's like Milky Bar but a smidgeon less sweet. A few cans of milk coffee, no Boss though. They need a vendo outside to make it authentic. We get some bulldog sauce for when we have tonkotsu next. Japanese Cheesecake made by Fuji Bakery. Tiny little cakes - Sweet potato, chestnut or fruits cake. If we had a little Japanese broiler, we'd take these sanma fish and play izakaya at home. There was a big selection of frozen fish. Whole boxes of Hokkaido scallops. Lots of lovely preprepared ebi and tako. There was a choice of lightly grilled or not for the tako. Tiny little fish sprinkles for your bento. Bags of takoyaki. Use bulldog sauce, bonito and kewpie mayo and you're all set. A big range of frozen noodles. A great selection of ice creams in the freezer, including fish wafers with red bean (but not fish). Lots of little sweet daifuku to choose from too. Sitting outside we scoffed our sweet potato cake, a quite plain cake with little bits of tayto in it. Shawn relives his finest vendo moments with a cold coffee in a can. Our dining partner outside betrayed golden retrievers everywhere by not realising there was food nearby and ignoring us, even as we rustled wrappers and plastic bags. He'll be sacked from the union. 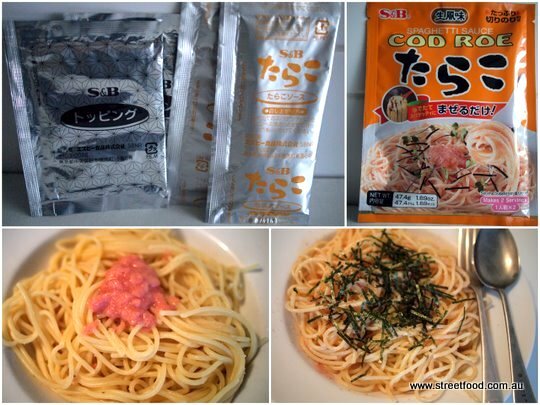 Update: By the time we finished writing this, we tried the cod roe spaghetti in a packet. It's a salty fishy taste, with a cod roe paste in one packet and a sprinkle packet in the other. Great for a last minute skeddi fix. Tokyo Mart is at Northbridge Plaza, 79 -113 Sailors Bay Road, Northbridge. Open 7 days. Also stocks a range of other Asian ingredients. It is lucky for you that you have found authentic Japanese stuffs in Australia, isn't it? Especially Chuu-hai. Left one of the photo is grape taste, centre is lemon-like taste and right is grapefruit taste. As for Sake, left on of the 3 seems delicious but there does not seem DaiGinjou (like Grand Cru). Tonkotsu means pork bone broth and what the sauce is used is Tonkatsu (pork cutlet). Thanks for the correction on tonkatsu and tonkotsu - I always get them mixed up. But never in the same dish. Japan withdrawal's yes we are suffering the same Tokyo mart is as close as I will get till my next trip. Thank you guys for your reports on Tokyo we have just come back and wow what a place. This place is awesome. The Korean place next door to it does a great bi-bim-bab!